Description: The Living Tree is a live foods salad bar. We offer a full service salad bar, fermented foods, Kombucha on Draft, grass fed beef, and free range chicken. Veggie, vegan food heaven! Delish salads & great stuffed baked potatoes! Their specialty is kombucha made onsite in a variety of flavors. Environmentally friendly establishment and worthy of your business! Friendly staff and owner is very knowledgeable about the products she has in the store. She has books on using oils & herbal products. 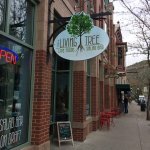 Been to The Living Tree? Share your experiences!